Bose SoundTouch 300 soundbar review | What Hi-Fi? Bose’s latest soundbar offering, the SoundTouch range, is much like the Build-A-Bear concept. Choose your basic product first, then accessorise away to your heart’s desire. In this instance, you can add Bose’s Acoustimass 300 wireless subwoofer (£600) and Virtually Invisible 300 wireless surround speakers (from £250) for a more compelling surround sound system that’s still more compact than most traditional speaker packages. Wireless multi-room set-ups are very much on the menu too. Of course, the single bar route has a space-saving benefit over multi-speakers, and in that respect, the SoundTouch 300 does a fine job of spreading sound around a room independent of any assistance. Having Bluetooth built in puts it on a par with the majority of soundbars across the price spectrum, and the convenience brought by NFC is a sure-fire bonus. But less typical of the soundbar marketplace is its ability to stream music from the likes of Spotify, Deezer and Amazon Music, directly via the Bose SoundTouch app. You need an internet connection – through wi-fi or, preferably for greater stability, an ethernet cable – to get up and running through the app. This becomes your portal to access internet radio, music on your server and local files. The remote, which can be programmed to control other sources too, is still the go-to for playback controls, but for streaming, the app is one of the most user-friendly experiences we’ve come across. Presets offering shortcuts for specific songs, albums or artists are valuable inclusions, and we like that Spotify is built into the app itself so you aren’t redirected to the streaming service. Bose knows that making a soundbar doesn’t just mean moulding a standard wireless speaker into a shape that’d fit under your telly, and has included soundbar-specific technology to help hone its capacity within a home cinema environment. 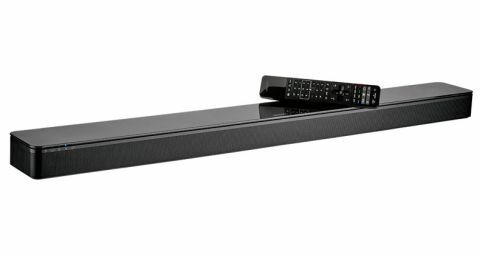 It uses the company’s PhaseGuide array technology, introduced in the brand’s first ever soundbar, which is designed to separate channels of a soundtrack and push it out wider than the physical size of the bar. The purpose of Bose’s QuietPort technology is to ensure distortion-free deep bass at any volume, and the ADAPTiQ calibration feature helps it optimise the sound for your specific living room environment. The process is simple; put on the headpiece, plug it into the dedicated 3.5mm jack and follow the spoken instructions, which sends test tones to five spots around your listening position. There’s a second 3.5mm jack to hardwire the optional subwoofer, but your main means of connecting to a TV or projector is via the unit’s optical or HDMI inputs. Going down the HDMI route won’t limit your viewing options to standard Blu-ray, as the HDMI Audio Return Channel (ARC) output, from which you’d connect your telly, is compatible with 4K pass-through. The Bose design team’s motto might well be ‘soundbars should be seen and not heard’. The SoundTouch 300 is likely to sink into the visual space at the bottom of your TV thanks to its black, sleek and discreet look. And thanks to its reasonably flat, 6cm-tall stature, it shouldn’t obstruct any screen it’s in front of. The perforated wrap-around metal grille and glass top rightfully distinguishes it from the plastic builds lower down the price band, and while physically it’s a good spread across a 50in telly width-wise, there’s no question it has the breadth of sound to be used with a bigger one. Which is exactly what you need when experiencing Star Wars: The Force Awakens on Blu-ray on a 65in Samsung UE65KS9500. We connect it up via HDMI and hit play on our Cambridge Audio CXU Blu-ray player, and immediately find that the Bose has no issue pushing the soundtrack beyond each corner of the screen. While ships hardly feel as though they’re flying overhead, there’s a good sense of them entering, travelling across and exiting a soundfield that’s big, expansive and well integrated. We can’t resist whacking the volume up for the legendary Star Wars theme, and the SoundTouch 300 doesn’t dampen the occasion. It’s capable of volume that’ll have your neighbours knocking at the door in no time. However, thanks to the presentation having plenty of weight and body, it stays reasonably composed. Like many before it, the Bose ultimately falls short of the standard set by the class-leading competition, which includes the multi-Award-winning Dali Kubik One. It has the upper bass punch and power to get behind exploding ships and collapsing planets, but doesn’t burrow deep enough to communicate the underlying thrum – a gap for the Acoustimass 300 wireless subwoofer to fill. While voices peep through the action with clarity and enough detail to get across masked Kylo Ren’s crackled robotics, the Dali has the midrange transparency and extra solidity to make it all the more menacing. Renowned sound effects, whether it’s R2D2’s robotics, the zing of the BB-8 or the whirr of interlocking lightsabers, don’t have quite the crispness or subtlety through the SoundTouch 300 either. Dynamically, the orchestral score doesn’t rise and fall as dramatically as it should beneath the action, and by neglecting the huge climactic sweeps that make John Williams’ score so majestic, ultimately the Bose can only sound so thrilling. When you’re spending this much on a soundbar, a thrilling sound is no less a requirement than an input connection. Sadly for the Bose SoundTouch 300, its generous network features and practical design can only save it so much. Unless you’ve already bought into the SoundTouch family and are dead set on expanding your multi-room set-up with a soundbar, we’d be slightly cautious about parting with our pounds here.